Joining a faction is one of the first things you should do as a new player. Use the /f l,list [page=1] command to list the factions. To learn more about a certain faction you can use the /f p,player [player=you] command which for example will display all the followers. To learn more about a certain follower you can use the /f p,player [player=you] command. Once you decided what faction to join you can use the /f join <faction> [player=you] command to do so. If you change your mind you can use /f leave to leave. Your faction may have a special home location. You can teleport there using /f home. You can also teleport to the homes of your allied factions using /f home <faction>. Use the /f map [on/off=once] command to see the territorial land map and get an understanding for what factions own the land around yourself. When using a commands that takes a faction as an argument you can actually specify a player name instead. That faction that player belongs to will then be used. You can use /f create <name> to create your own faction. If you later on decide you want a different name for your faction you can rename it using /f name <new name>. Use the /f desc <desc> command to set the description for your faction. The description is shown when walking into the faction territory or when using the /f f,faction [faction=you] command. Use the /f desc motd [new=read] command to set the faction message of the day. This message will only be displayed to your faction members as they join the server. This can be used as a simple news system. Finally you should set the home teleport location for your faction using /f sethome [faction=you]. If you for some reason would like to remove the home location later you can do so using /f unsethome [faction=you]. Now it’s time to get some followers for your faction. Use /f inv,invite <player> [yes/no=toggle] to invite a player to your faction. The same command can be used to revoke invitations. If a faction follower is misbehaving you can kick them using /f kick <player>. If they are doing great you might want to reward them with a custom title using the /f title <player> <title> command (ampersand color codes work). There are four different faction ranks. They are **Leader, *Officer, +Member and -Recruit. Use the /f promote <player> and /f demote <player> commands to modify someones rank. There is also the dedicated /f officer <player> command to make someone an officer. There can be many officers but only one leader. Use the /f leader <player> [faction=you] command to resign your leader role and faction ownership to someone else. The higher your rank is the more permissions you get to manage the faction. For example anyone may deposit money into the faction but only officers and above may withdraw. Make sure to promote some trusted faction followers to officers. This way the faction can still be managed even if the leader goes on vacation. Each faction has a money account. The money commands can be used to check and transfer money in various ways. Certain actions like renaming the faction or claiming land may cost money. The faction money will be used for this. Faction land is claimed chunk-wise. A chunk is 16×16 blocks spanning all the way from bedrock to sky. Use the /f sc,seechunk command to see the chunk you are currently standing in. A faction can claim as many chunks as it has power. The faction power is the sum of all followers individual power. Each player has 10 power meaning that a faction with 10 followers would have 100 power. A player looses 2 power on death and regains 2 power per hour. Use the /f claim command to claim chunks for your faction. Use /f claim one to claim the one chunk you stand in. Use /f claim auto to claim by walking around. After you have walked around your base you can use /f claim fill. You can also stand in the middle of the base and claim a 3 radius square using /f claim square 3 or circle using /f claim circle 3. To unclaim land you use the similar /f unclaim command. For example /f unclaim one or /f unclaim auto or /f unclaim fill or /f unclaim squre 3 or /f unclaim circle 3. There is also the advanced /f claim all and /f unclaim all commands. You can transfer all land from OldFaction to NewFaction using /f claim all OldFaction NewFaction. Use /f claim map OldFaction NewFaction if you only want to transfer chunks on the current map. Or specify the map name like /f claim MapName OldFaction NewFaction. Likewise you can unclaim all land for YourFaction using /f unclaim all YourFaction or /f unclaim map YourFaction or /f unclaim all MapName YourFaction. This is not possible. Choose your officers wisely. Use /f access f yourfaction no to remove build rights for normal faction followers. Use /f access f yourfaction no and then /f access p playername yes. First consider downgrading that relation to a truce. If that’s not an option you can remove them using /f access f <faction> no. The default relation wish towards another faction is neutral. This wish can be changed using the relation commands. The ally and truce relations need to be mutual to take effect. The enemy relation is however one-sided. If another faction wants to be your enemy you will be enemies whether you want it or not. Friendly fire is blocked for followers of the same faction as you, factions in truce or factions you are allied to. Additionally you can not hurt neutrals in their own territory. If you want to attack someones faction base you must declare your faction as an enemy to theirs. Damage from enemies is reduced by a certain percentage while inside your own territory. The difference between ally and truce is that allies are allowed to do about the same things as normal faction members. Allies can build in your territory, open containers etc. For this reason you should use truce instead of ally unless you really really trust the other faction. Territorial warfare between enemies may be possible unless the server owner disabled it. Kill followers of your enemy faction so they loose power. After a while the faction power will have dropped below the amount of chunks they claimed. When that is the case you can start unclaiming, or even claim, their chunks at the edge of their territory. Safezone and Warzone faction can be created where the rules are different. Safezones can not be claimed by other factions. PVP is turned off and monsters may not spawn or hurt players there. Warzones however are not safe from PVP and monsters. Further, they can be configured to have friendly fire enabled so that PVP between allies and faction members is possible. 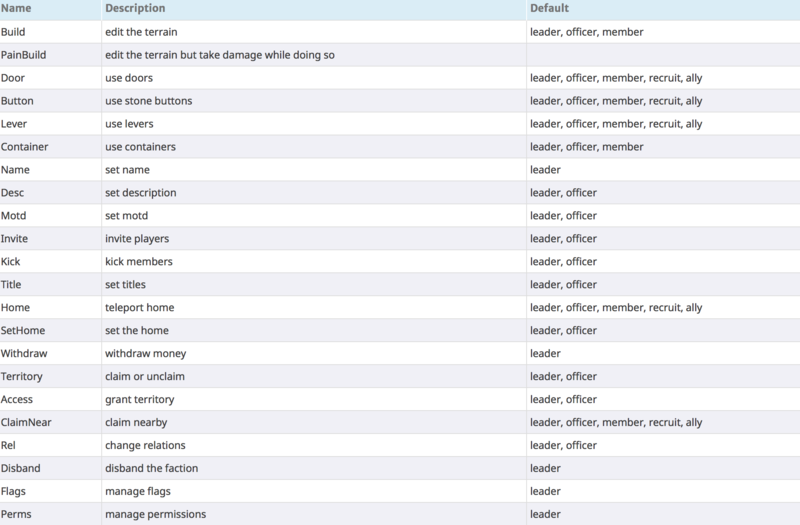 These two factions are created by default but additional ones can be created and configured using faction flags (further down in this documentation). Who is allowed to do what within a faction can be managed by the faction leader using the /f perm command. Anyone can type /f perm show or /f perm show yourfaction to show the permission configuration for yourfaction. Use /f perm show <faction> <perm> to focus on a special permission. For example using /f perm show <faction> build would display the build permission configuration in the faction. Add in the last two arguments to set the permission for a certain relation. For example /f perm set lever truce yes would allow those in truce to use levers within the faction territory. A faction flag is a boolean (yes or no). Any player can display the flags of a faction by using /f flag [factionname]. Some but not all flags can be edited by the faction leader. As an exercise I suggest you run /f flag safezone and /f flag warzone. The flags for these factions is what makes them work in that special way they do.